Most readers of the Wall Street Journal, including this writer, were stunned this morning, after reading of Trump's comments regarding his decision not to cancel NAFTA. However, it wasn't Trump's reversal on NAFTA, where he did, in fact, state during his campaign that he would seek a complete renegotiation rather than an outright cancellation, of the job-devouring trade agreement, if possible. The question for most of Trump's voters, after well over one year of hearing Trump consistently trash-talking the failed agenda of multicultural globalism, would now be which side, exactly, does Trump fall on? Moreover, how can a leader, or anyone else for that matter, be both a nationalist and a globalist, at the same time? Unfortunately, the people that voted Trump into office, his base, have continually fallen victim to the GOP leadership's prevailing mindset of being two things at once, during Trump's first 100 days. The leaders don't appear to be serious about repealing and replacing Obamacare any more than they are serious about building the wall that propelled Trump into his office. When the wall is brought up, in the inner-beltway inner circles, the politicians laugh, raucously, despite most of them having voted for such a wall back in 2006. They are, in fact, laughing at both Trump and a now politically wounded American traditional voter. In fact, with all the talk of transgenderism, it almost seems fitting that the American traditionalist voter largely sees our congressional GOP leadership as a fuzzy form of trans-republicanism. They, the GOP leaders, mostly say all the right things, however, when an important policy decision comes along, that enables the path of globalism, against overall US interests, they'll routinely transform into lockstep, along with their left-wing progressive counterparts in the Democrat party, and then, after the blow has been delivered on behalf of international interests, it's back to the kabuki theater routine for all of our fake political amusement. Trump, unfortunately, cannot have it both ways; he can't serve the interests of America and the interests of international globalism at the same time--it would be tantamount to serving two masters at the same time--and those two battling masters, in particular, will always be at severe odds. The bellwether model to at least look towards, for understanding such a political agenda, would be the EU and its unelected representatives who've created unimaginable chaos within their own various nations under the murky demigods of globalism. 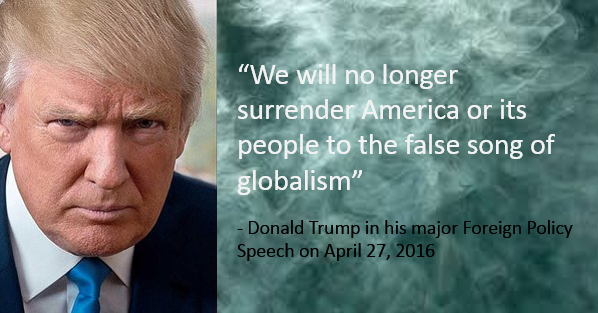 Moreover, it should be noted that for the most part, all of Trump's domestic policy moves would seem to contraindicate any sort of migration towards globalism, for his part; however, his foreign policy moves, with regard to globalism, leaves room for at least some doubt to creep in. All in all, however, it's the very thing Trump campaigned against, and his reversal, now on globalism, would mean that much of his campaign was a complete, if not unmitigated, lie and maybe even worse. His promises would then be all but less than worthless, as well, if this new paradigm were truly the case, but, there are quite a few Neocons, who were formerly Trump's sworn enemies, celebrating fervently on this particular bit of news, today. The question, on Trump's sudden affectation for globalism, becomes one of was he really serious after all of his railings against it during the entirety of his campaign? It's a question, by the way, that we should not have to ask.